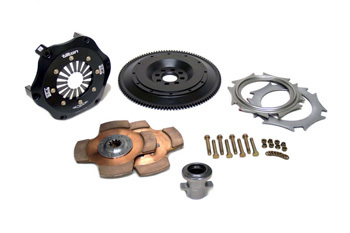 Intended for Spec E46, Tilton’s BMW clutch-flywheel assemblies provide a substantial weight-loss advantage over the stock 36.6-lb assemblies. At just 13.6 lbs, Tilton’s 1-plate BMW clutch-flywheel assembly is the lightest option, cutting over 54% of the weight from the stock assembly. A 2-plate option is also available, which provides greater torque capacity and an improved wear rate and, at 16.2 lbs, still comes in over 20 lbs lighter than the stock assembly. The 2-plate is also optionally compatible with E46 M3 models.